I'm usually more known as a crafter of words as opposed to a crafter of things, but here's a throwback to my most successful DIY project. For my wedding in 2010, I made the place cards and boutonnières on my own—not too shabby if I can say so myself! 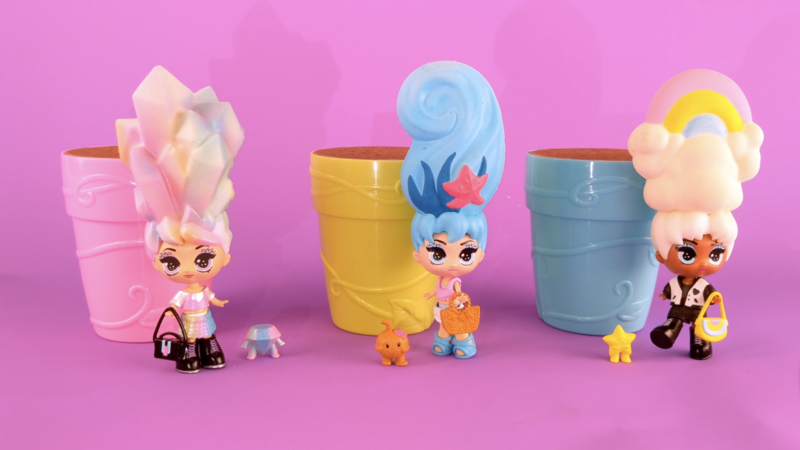 Everything else, well, ETSY! I think my projects are as good as the pros', no? The top two photos are DIY, the rest was PSE (pay someone else). 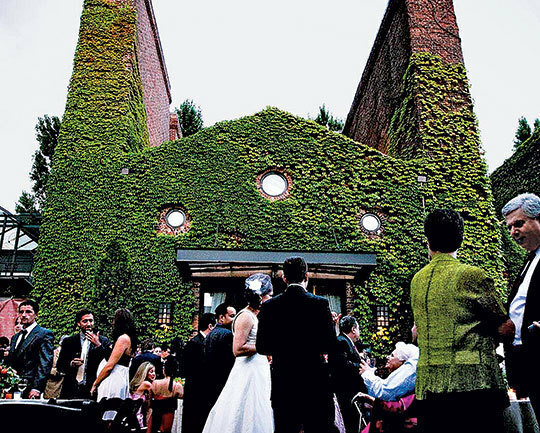 This is a little old, but for the Winter 2014 issue of New York Weddings, I did a round-up of venues in repurposed buildings like an old foundry, a 1920s tycoon's office, and even a president's house. A farm, a post office, a millinery, a chorizo factory, and other converted spaces that make for picturesque party spots. In the 1800s, the Albra Metal Foundry melted scraps of metal to recast for the city’s many manufacturers. Today the 2,000-square-foot building still retains its industrial roots with tons of exposed brick throughout the multilevel space, original ovens and cauldrons, and an abundance of ivy growing along the outside and in the courtyard. The chimney shafts are all original, and one of them actually contains the bridal suite. (With a simple padded bench, a few mirrors, and a skylight, this space is meant for touch-ups and a quick respite, not an overnight stay.) The indoor space can fit 200 guests for a cocktail party or up to 125 for a sit-down dinner. Rental fees, which cover twelve hours, range from $5,200 to $11,200 for the main space; couples must book their own caterers. 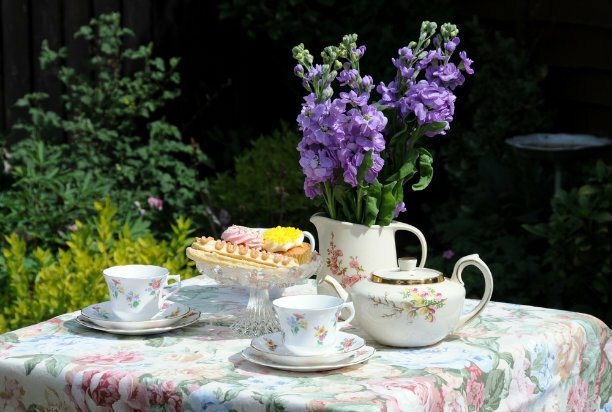 Because dates in peak months get booked quickly, the venue recommends reserving fourteen to eighteen months in advance. 42-38 9th St., Long Island City; 718-786-7776; thefoundry.info. Click through to read the rest of the article on the website of New York. 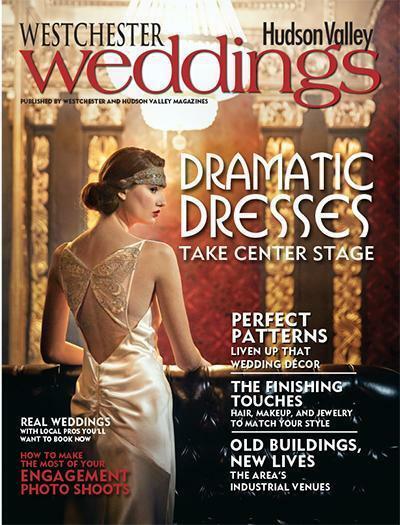 -Spotlight-worthy gowns shot on location at the Capitol Theatre in Port Chester (as seen in the cover image above). -Four event designers and two cake bakers who demonstrate how to incorporate patterns into reception decor without overdoing it (written by me—see PDF below). -Repurposed local venues that had former lives, as factories, warehouses, and mills. -Hair, makeup, and jewelry that make for the perfect finishing touches. -Six real weddings: a DIY summer wedding, a "lovebird"-themed summer wedding, a farm-inspired fall wedding, an edgy tattoo- and graffiti-inspired wedding, an eclectic winery wedding, and a traditional winter wedding. -Photographers' advice on how to make the most of the engagement session—plus their favorite shots (written by me—see PDF below). -Florists' recommendations for out-of-the-box bouquet ideas. -﻿﻿﻿Great Gatsby﻿-inspired fashion ideas for him and for her. -A round-up of fun bits of wedding-day inspiration, from wooden bow ties to embroidery hoops. The issue only comes out once a year, but I also scout weddings for our Wedding of the Month blog. These are two features included in the 2013 issue of Westchester/Hudson Valley Weddings. I didn't write either of them, but the PDFs look much better than the web versions. I am the executive editor of this annual publication. Here, the feature "Something Old, Something New," featured in Westchester/Hudson Valley Weddings' 2013 issue. The feature pairs traditional floral bouquets with more modern equivalents made from non-floral materials, such as paper, felt, or brooches. I am the executive editor of this annual publication. Here, one of the "Real Weddings" featured in the current issue of Westchester/Hudson Valley Weddings. I am the executive editor of this annual publication.